This leaked HP internal memo at Engadget shows the HP Slate's got a 1.6GHz Intel Atom Z530 processor and five-plus hours of battery life. 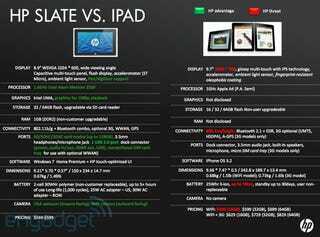 That's in-line with what we'd heard already, but the memo's also a great tale-of-the-tape iPad comparison. The other details: looks like we were also right with the $549 price tag for the base 32GB flash memory storage, while a 64GB version will be available for $599. The Slate's going to have a 8.9-inch 1024x600 capacitive multitouch display, 1GB RAM, Intel UMA graphics with 1080p playback, an SD card slot, SIM card tray for optional WWAN, USB 2.0 port, and an inward-facing VGA webcam/outward-facing 3MP camera. As HP's recent product demos have indicated and this chart proves, they clearly know where their strengths are—along with their weaknesses. It's interesting that despite all those extra goodies, the Slate's still going to come in at equal weight to the Wi-Fi iPad and a little lighter than the 3G version. Also that HP considers Windows 7+TouchSmart to be a wash with iPhone OS 3.2. Until we actually get to see more of the HP Slate UI, we're going to have to take their word for it, or just argue endlessly in the comments.